Is this the Christmas that you are going to switch it up and do a little something different? 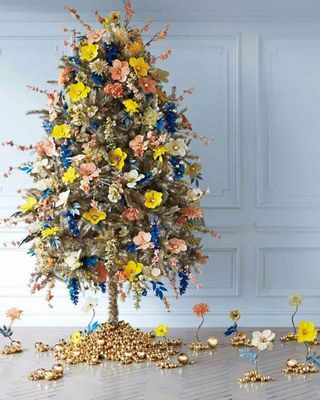 Well ... you've come to the right place, we've curated quite a few alternative Christmas Trees. From a flock of DIY doily Christmas trees to a magical floating Christmas Tree that will dazzle and amaze you. It's beginning to really look like Christmas. Starting off with this effortless downy snow faux pine tree. Bring the snow inside. Not much room for a full fledged tree this year. Not to worry there are plenty of great flat tree ideas on Pinterest. We love this flat frame tree idea because it acts as a room divider with the added benefit of being able to see through it still. Still want that pine scent from a real live tree but can’t find the room? 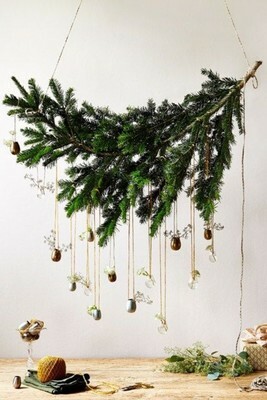 Trying having a branch of a pine tree up and tying your ornaments to it. 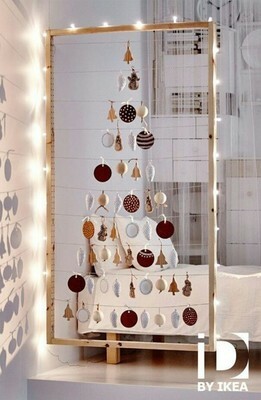 It’s like a sweet little Christmas themed mobile that is sure to bring cheer to what ever space it is hanging in. 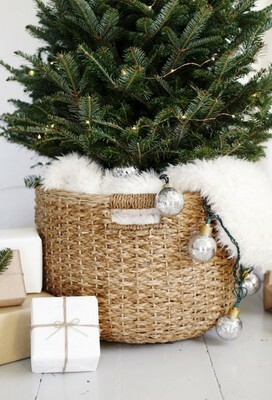 This cute and cozy tree stand idea works for both live and faux trees! And when we say live we mean those cute little trees you see in pots with their roots still attached. 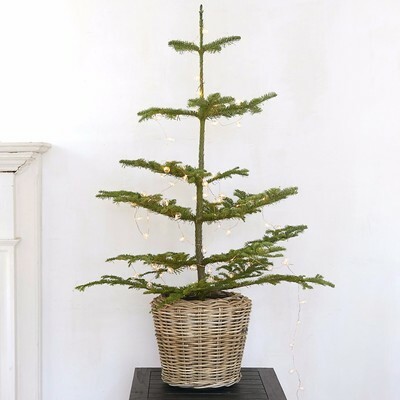 If you are celebrating your first Xmas in your first home, You can plant that lovely little tree in your yard and remember that first Christmas for years to come. 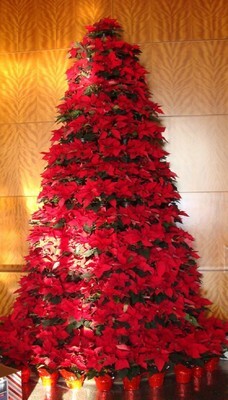 For those with a pine allergy and loads of free space, how fabulous would this Poinsettia look in your home! Such a perfect holiday icon. 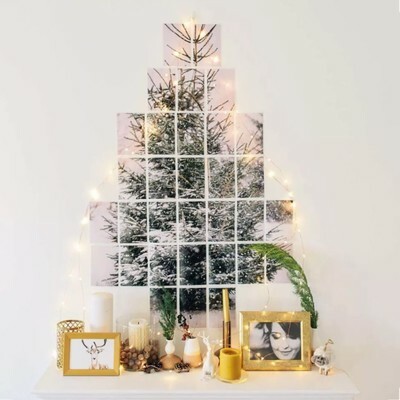 Looking for a wall tree decor idea that won’t leave upset your landlord with a bunch of holes? 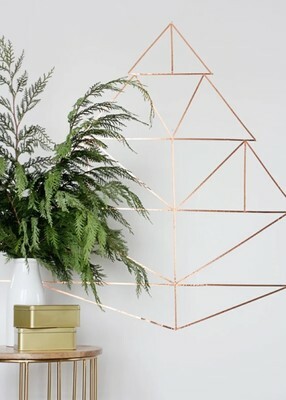 All you need is a couple of rolls of copper Wassi Tape. Spread the Christmas cheer even to your and your friends offices. 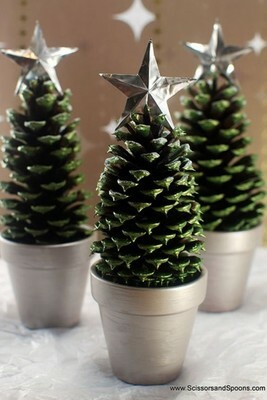 These cute little pinecone trees are easy enough to make with a few crafts and some hot glue. These days its a cinch to get your photo printed… so why not snap a photo of a beautiful tree in the snow and print that up as your tree! We love this set of photos that sort of puzzle together to form the image of a tree. So cute! OMGoodness! We love a rainbow in the Wedding Chicks office and the thought of having a rainbow tree nearly put us over the moon with pure joy. We love it, and you know what they say about love? Love is love… is love is love. And for our warmer weather Christmas celebrators, don’t think we’ve forgotten about you. We found this tropical flower themed tree that caught us so off guard we just had to stare at it in amazement for a few minutes. No, they aren’t real flowers, but boy do they make for quite the beautiful statement piece for your front window. Have a chalkboard wall? Did you find a kickass vintage birdcage while you were thrift shopping or yard sale-ing this summer? 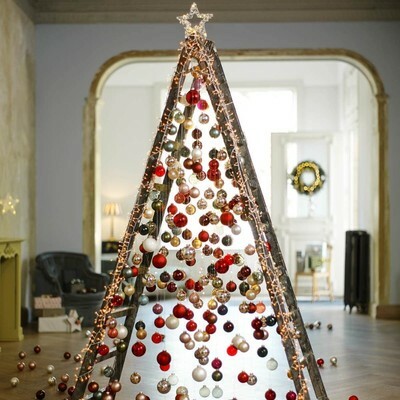 Then this is the perfect way to add some funky Holiday cheer to your home! 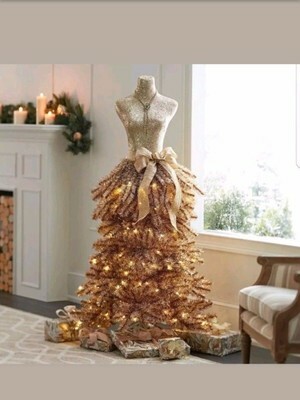 I saw this gold Christmas Dress last night at TJ Max. I should have bought it, it was only $100. Run down to your local Home Goods to see if they have one or bid for it on Ebay. No bad ombres here! 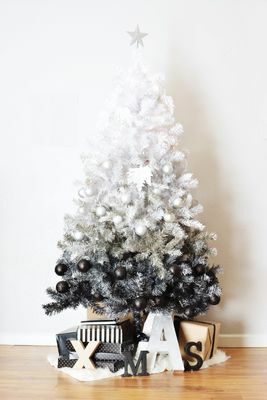 This white, silver and black christmas tree has us swooning and looking for any reason to keep this beautiful faux tree up year around! 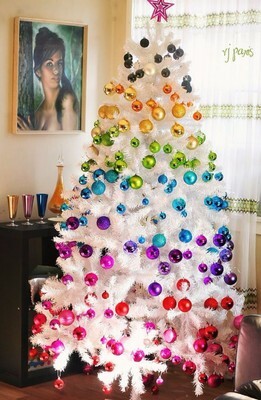 looking for more white xmas tree ideas? One year I am definitely going to do this. 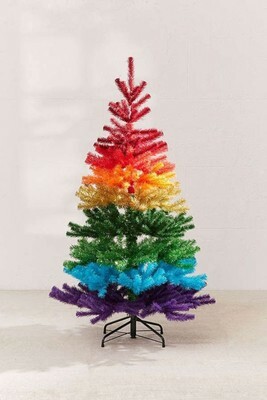 The thought of a rainbow Christmas tree makes me so happy. 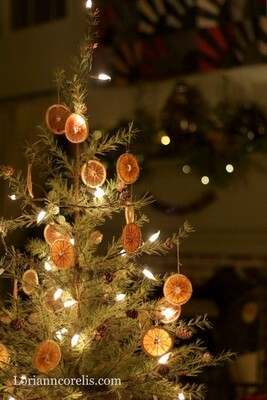 See a few more ways to decorate your tree here. Not wanting to purchase a full tree but still looking for that authentic pine scent in your home? 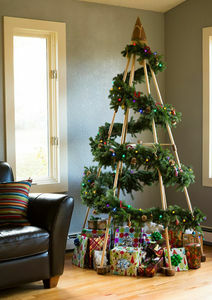 This pine branch tree not only saves you space but is sure to leave your home smelling pine fresh! Domino gave us some awesome ideas for minimalist trees. Martha Stewart knows how to do it right! 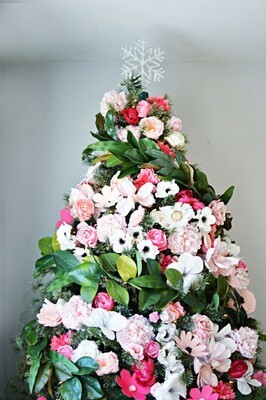 We are so in love with this flower christmas tree, it feels so fresh and cheery! Find out what it took to make this gorgeous tree here! 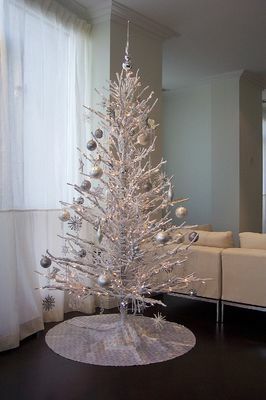 So you've heard of a white christmas, but what about silver christmas trees? The chic and frosted feeling of this glamorous tree dressed in sparkling silver decorations is the perfect holiday decor element for your ultra modern home! 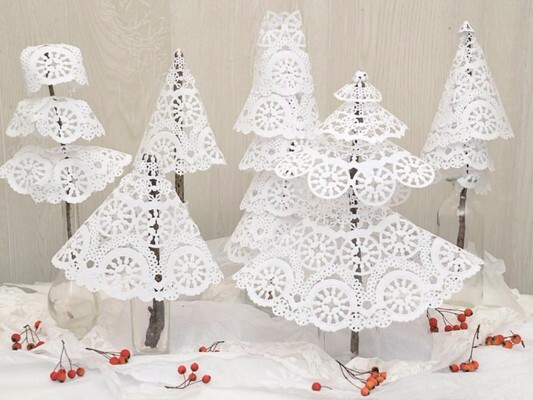 If you're feeling a little DIY-ish, then whip up these adorable doily Christmas Tree. HGTV shared with us how to make these festive shabby chic numbers. 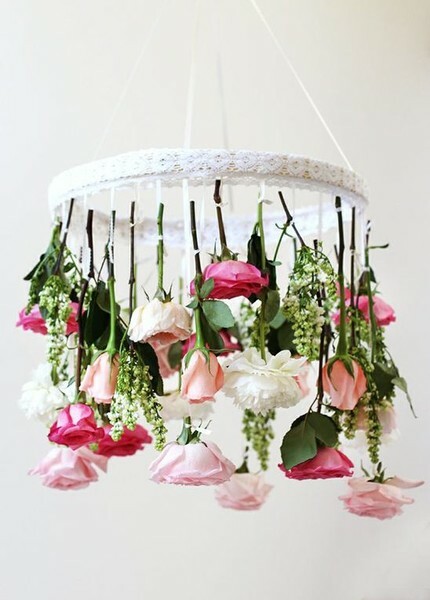 You'll Need the following supplies - paper doilies, hot glue gun, twigs branches and vessels to hold them(vintage milk bottle, glass vase, glass cups). Cut a wedge out of a round doily and bring the cut edges together to form a cone. The size of your wedge will determine how narrow the cone is. Glue the cone together and slide onto the stick. Glue into place. Add more cones in decreasing sizes to create a layered tree. For all our Southwest friends or those who're just desert lovers, we know you have more cacti than pine trees so why not just add a little festive cheer to your natural surroundings? 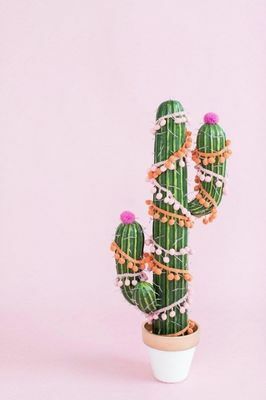 See the how to for this cactus by visiting Sugar & Cloth. Oooooh how magical is this tree/wall decor?! 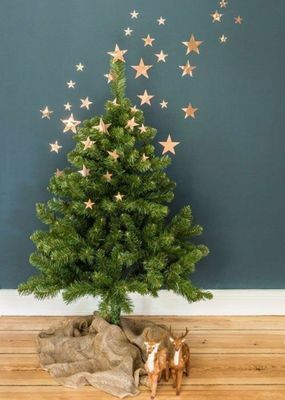 Not only is this copper star tree decor whimsical, it also cuts down on all that work of decorating the lower half of your tree! Love it? see more of it at OhhhMhhh! Trees can be expensive, so if you are looking to save a little cash this holiday season then we should mention our favorite new alternative tree trend. The ladder tree! It can be dressed up or dressed down, minimal or traditional, and take down is a breeze. We just might do this for our office this season. If you already have a chalkboard wall set up in your home why not play around with that for the holiday season? And if you are open to a large change to your decor, check out this fabulous Chalkboard wall DIY by Mr. Kate. No room for a tree? Why not head down to your corner tree lot and ask the folks there if you can take a few of their discarded branches. This way you can enjoy that lovely fresh pine scent in your home but without sacrificing any floor space! Go green with these cute little saplings that you can eventually plant after the snow melts and then you will have your Christmas tree for years to come. Just head on over to your local nursery and they should have several for you to choose from! The Noble fir is the largest native fir in North America. Its pyramidal shape is narrow but strong, with horizontal branches and curved, blue-green needles accented in white. This sustainably-harvested, tabletop specimen arrives ready for display with a matching stand and rattan basket with a watertight liner. For the modern loft dweller, a traditional Christmas tree might look a bit out of place. That is why we are in love with this raw plywood tree! Not sure what to do with that fabulous shipping pallet sign you made for you wedding day? 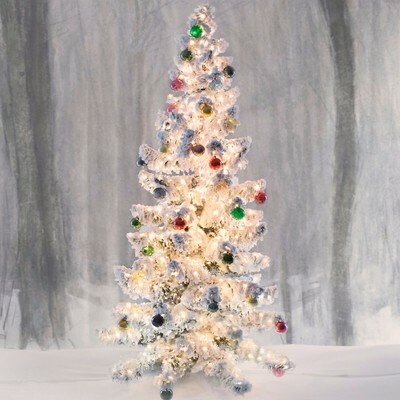 Sand it down, re-stain it and paint on the perfect Christmas tree! If painting a whole wall in chalkboard paint seems like too much of a commitment, why not just pair it down to a simple canvas? This cute little chalkboard tree is perfect for a home that is short on spare space. OMG! Talk about over the top girly! This soft pink tulle tree is sure to have your inner 10 year old girl squealing! But to be fair, we squealed out loud when we first saw it too. 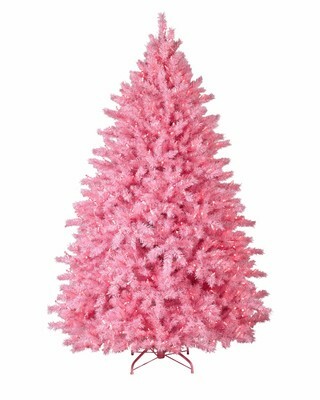 I've always wanted a pretty in pink Christmas tree! This particular one even has pink wire, pink lights, and a pink base. It happens to be their most popular tree. Who knew! We know that not everyone lives in places where it snows for the Christmas season, so why limit your decor ideas to simply pine trees? We love the whimsical nature of this cactus strung with twinkle lights. Who doesnt love a good succulent centerpiece?! Well, did you know that there are vendors on Etsy, like Succulent Solutions, where you can purchase a cute little succulent arrangement in the shape of a Christmas tree? Go check them out! Now this took some dedication, but imagine the fun that was had while emptying all of those bottles. Pre-Christmas Christmas party anyone?! Hey there college students, not sure what to do with all those text books that the books store wouldnt buy back? Pile them up, throw some lights on top and you are all set for the Holiday season. Do you plan to be on a beach somewhere for the month of December? Well, this tree branch placed in a sand filled glass jar sets the perfect mood for your warm weather Christmas. Lets just be honest, sometimes the simplest idea is the best. 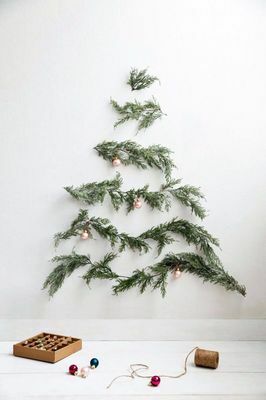 We can't help smiling when we see this snow covered fir tree print jazzed up with a simple homemade garland! It really will be a magical holiday with your floating Christmas Tree. Yes, you read that correctly. 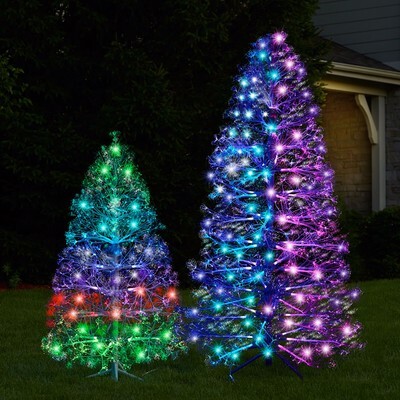 This illuminated outdoor tree that generates displays of color and light with a gravity-defying 3D floating effect creating a multi-dimensional light show. Your tree will look like it is hovering above the ground. 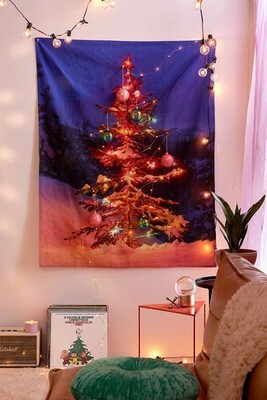 You can actually hang ornaments from this Christmas Tree wall tapestry. 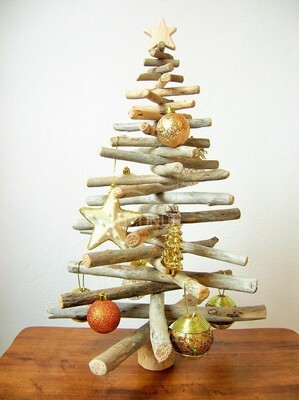 The fantastic thing about driftwood Christmas trees is that you can take your holiday decor off of them, and use them all year round. The make fantastic decor pieces. We cannot get enough of this reusable piece of art.